Bison or buffalo meat popularity has grown throughout the United States due to its comparable amount of protein to beef with about a quarter the amount of fat. Typically fat content in meat is what provides its tenderness, however, if you know how to cook bison you will still end up with a tender and juicy cut of meat. Our recipes factor in the proper techniques in order to avoid drying out this lean meat. Bison would be even more popular if the price matched that of its beef counterpart. Bison ranges in price depending on your location but it tends to be about $10 a pound. 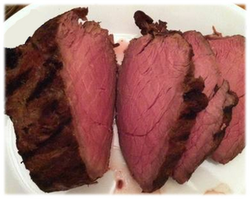 Smoked Bison Roast Recipe - The low fat content in bison makes this a healthy alternative to other smoked red meats.